What time is it? 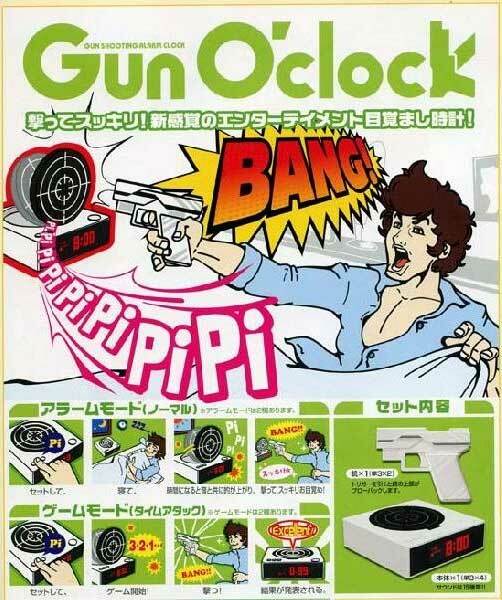 Gun O’clock! Japan seems to love unique ways to wake up in the morning. You may remember the Japanese Ministry’s children army training clock that I wrote about before. For those of you secret agents out there, this is the ultimate training clock that will keep you on your toes right out of bed. This clock has 2 modes, time mode, and attack mode. When the alarm goes off, which is a very loud and annoying one sure to wake you from dreaming of Aoi Yu. Along with the annoying sound, a target pops up. You then can take the accompanying infared gun and fire at the target to silence the annoyance. A.K.A Secret Agent Training Mode. Upon alarm, the clock will taunt you as you have to shoot the target, not only hitting it, but it has to be a direct bulls-eye. One bulls-eye isn’t enough to prove your steady aim. Oh no. You must hit it a series of times till the clock believes you have had enough training for today. Upon a successful training, you will be praised in Engrish, and able to start your day.